Indoor plant lighting gives plants most of the energy they need to grow, thrive, even to stay alive. Wondering what plant to put where? 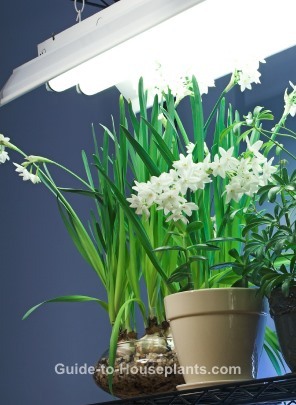 Here's an indoor plant lighting guide to four categories of light exposure for house plants. What is a sunny (direct sun) location? Within 2 feet of a south- or southwest-facing window. Window sills flooded with sunlight. What is a bright (indirect sun) location? Within 4-5 feet of an east- or west-facing window. 3-5 feet from a window that faces south or southwest. Any place where the sun shines into a room for several hours. An east-facing window where the morning sun shines into the room for only a few hours. Morning sun is cooler than afternoon sun, so you don't have to worry about overheating your plant. At least 3-5 feet away from a window that faces south or southwest. Directly in front of a north-facing window gives a plant low-to-medium light intensity. More than 6 feet away from a south- or southwest-facing window. Hallways, staircases, and corners of rooms. Near windows that are shaded by trees. Getting Indoor Plant Lighting Right: Not Enough Light...or Too Much? 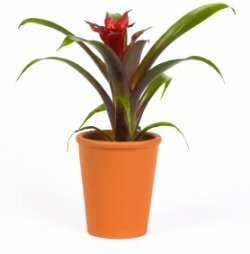 If your rooms don't have enough light for your house plants, artificial indoor plant lighting may be the solution. It can supplement natural daylight -- or even replace it during the winter months when the days are shorter and the intensity of light is much lower. Artificial lights provide the sun's spectrum of wavelengths, which we identify as colors. For example, white light carries all the colors of the rainbow. Plants need the cool blue and violet hues of the spectrum for foliage, and the warm red and orange for flowering. Reading light is mostly green and yellow -- two colors that plants don't need. Fluorescent lights are efficient because they provide the type of light (the blue and red parts of the spectrum) that plants need for photosynthesis. A good setup includes a half-and-half combination of cool-white and warm-white fluorescent tubes mounted under a reflector. They should be 40 watts each. Keep foliage plants at least 12 inches below the lights and flowering plants 6-12 inches below the lights. If it's not practical to lower the light fixture, you can raise the plants themselves. Which plants are best for artificial light? 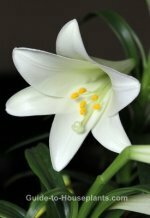 Many flowering house plants come to mind because they need bright light to bloom: begonia, bromeliad, African violet, orchid, and cyclamen. However, many foliage plants also respond beautifully to artificial lighting: polka-dot plant, spider plant, peperomia, nerve plant, and aloe vera. How long should lights be on? It depends on the type of plant. Foliage plants need about 14-16 hours of light per day. Flowering plants need 12-16 hours of light per day. Darkness is also important for plant growth so this gives your plants at least 8 hours of total darkness a day. Try to have the lights on at the same time every day. You can get an automatic timer for your lights to make it easier. Just set it and it'll come on the same time every day. If you water your plants on a schedule, you'll want to keep a closer eye on them. Plants grown under artificial indoor plant lighting may dry out quicker and need watered more often. It's also a good idea to increase the humidity levels around your plants. One of the easiest ways to do this is by using pebble trays. I like this idea because it allows the water that drains out of the drainage hole in each pot to flow into the tray of pebbles, creating extra humidity around your plants. And your plants will love it.